The only eligible voter in the North Oak Cliff Municipal Management District registered to vote using the address at this Dallas house. The 400-acre North Oak Cliff Municipal Management District includes the massive Canyon project being built by Stratford Land in West Dallas. And the one person eligible to vote for the financing? He’s the 24-year-old son of a vice president at Stratford. Plans for The Canyon in Oak Cliff include a hotel, residential living and retail at Interstate 30 and Westmoreland in Dallas. Stratford officials referred questions to Tim Green, an attorney for the financing district, who says this is standard operating procedure. “The use of these special districts has been a common tool throughout the State of Texas for the last 50, 60 years as a method for land development,” Green said. “There are thousands and thousands of these districts that have been created across the state of Texas that have been used to finance billions and billions of dollars of public infrastructure,” he said. 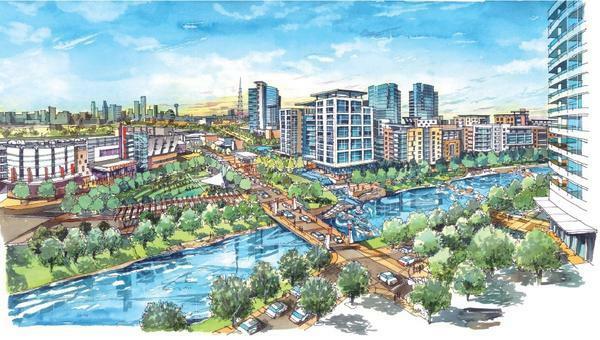 "We just don't have enough money"
Stratford Land went to the City of Dallas with a plan for turning the vacant land it owns at Interstate 30 and Westmoreland into a mixed-use development: $700 million worth of hotel rooms, residences, offices and stores. But the area also needed millions of dollars of infrastructure: roads, water lines and sewage. The city’s economic development director, Karl Zavitkovsky, says the city just couldn’t afford to pay for that. “We just don’t have enough money or enough bonding capacity to do all this and do all the other things we need to do to make our city strong,” he said. So city officials and local lawmakers convinced the state legislature to create the North Oak Cliff Municipal Management District with the authority to ask voters in the district for permission to raise money that would repay Stratford for building the infrastructure. But what do you do if there aren’t many, if any, registered voters living in the district you’ve created? Attorney Tim Green says that’s the situation here. “You are using these vehicles to develop vacant undeveloped properties," Green said. "There typically aren’t going to be people living in them." In this district, there is at least one house. Stratford Land owns the 49-year-old brick rancher. And that’s the address Austin Lee Vest provided when he registered to vote three months ago. Repeated visits to the house in the past week turned up nothing but barking dogs. So does Vest really live there? Attorney Green says, "yes," and says there’s nothing wrong about the district’s one voter being the son of Stratford Senior Vice President Ocie Vest. “We’ve created dozens upon dozens of districts, and they’ve had people who are friends of the developer, family members, the developer itself -- any number of people who are willing to live in an undeveloped area for a period of time," Green said. The Dallas County elections supervisor, Toni Pippins-Poole, says the district election appears to be legal. City officials say that the bond sale still must be approved by the city and that property owners in the district will be responsible for repaying them. And Zavitkovsky says Dallas will have a new economic center in a once neglected area. Still, Cal Jillson, a political science professor at Southern Methodist University in Dallas, says this situation is bound to raise eyebrows. “It is very unusual to have an election in which there’s a single voter,” he said, suggesting that the city could have gone beyond what’s required and publicized the process. “There should have been an extra political process: an announcement, an explanation, a response to questions." In an age where there’s often little trust in government, Jillson says, transparency is key. Like KERA News? Like us on Facebook. And follow us on Twitter. Democrat Wendy Davis may be a candidate for governor, but Tuesday night in Dallas she became a central part of a debate among Republicans running for lieutenant governor. While four Republicans are battling hard in the race for lieutenant governor, Democrats are hoping to persuade a spunky Latina from San Antonio to run against them. A million-dollar campaign by a political action committee and support from top elected officials helped grease the wheels for passage of Proposition 6, which creates a $2 billion fund to finance water projects. Dallas ISD: Miguel Solis has been elected to the Dallas ISD school board. He won with 66 percent of the vote, defeating opponent Kristi Lara. Solis briefly worked for DISD's embattled Mike Miles as the superintendent's special assistant, but says that won’t make him a Miles “yes man.” Read more about the race from KERA's Bill Zeeble.